Vintage NHL CCM Tampa Bay Lightning Jacket Pullover windbreaker mens medium 90s. Condition is Used. Shipped with USPS Priority Mail. ICE HOCKEY CCM JERSEY. 100% POLYESTER. 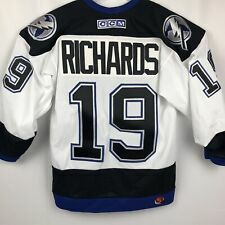 Tampa Bay Lightning Jersey Size 44 Pro CCM Black Away 1990s. Condition is Used. Shipped with USPS Priority Mail. I combine shipping. From a pet free and smoke free home. Steven Stamkos Sarina Sting Jersey OHL Tampa Bay Lighting (H11). Condition is Used. Shipped with USPS Priority Mail. Item is in excellent condition. There is some staining as shown in pics. No COA provided with jersey. Definitely great for any fan! Ships same or next day. US shipping is FREE! Measurements: Pit to pit: 26 in. Back of neck to bottom hem: 31 in. Reminiscent of the 90s, this old school Tampa Bay Lightning Jersey is a classic. This jersey is preowned. The “CCM” logo is fading in the back. No rips, holes, or tears. This jersey is in amazing condition. Please feel free to reach out with any questions. We’d be more than happy to help! Thank you for stopping by. THIS GOALIE DESIGN Has the Real Wide Sleeves and Shorter Body. THESE are VERY VERY Hard-to-Find,! SUPERB Quality and Made in USA by CCM MASKA KNIT. Light Grainy Polyester Fabric Embroidered Logos & Lettering. CCM Tampa Bay Lightning CENTER ICE HOCKEY JERSEY SIZE XL. Excellent pre owned condition! It has the Lightning crest printed on the front. CCM printed emblem is on the lower back of the jersey. A nice lightweight high quality jersey. It has the Lightning crest printed on the front. CCM printed emblem is on the lower back of the jersey. CCM embroidered on the back neck and left front tail. -Tampa Bay Lightning and logo sewn on the front. -Party Zone Bud Light on the back. FABRIC: 100% POLYESTER. BACK BOTTOM OF THE COLLAR TO THE HEM: 31 1/4". CCM Hockey Tampa Bay Lightning White Strap Back Hat Black and Blue Embroidered. Shoulder to wrist: 22”. Armpit to armpit: 25”. LENGTH 32”. PIT TO PIT 24”. IS IN NICE CONDITION WITH GREAT COLOR AND GRAPHICS. The jersey has stitched front graphic and is made in Canada by CCM for their classic Center Ice line. Body Length (collar to waist): 29". Arm Length: 21". Pit to Pit: 25". Vintage W/ Tags CCM Tampa Bay Lighting Stitched Jersey Men’s Medium NHL. Condition is New. Shipped with USPS Priority Mail. Show your love of your favorite NHL team in this stylish pullover hooded sweatshirt from CCM Reebok. Made by CCM Reebok. Check-Out Now! Welcome to Kevin’s Clubhouse! Shirt Measurements: Armpit to Armpit is: 25 Top of Shirt to Bottom of Shirt Length is: 31 Sleeve Length: 22 Item Notes: Brand New Without Tags. $5 to ship! Thank you for visiting the clubhouse! Please message me with any questions on this item! I will be more than happy to answer anything you may need! I don’t cancel orders so if you buy it, please pay. Also, if you have a chance, please check out the rest of my items in my store! We do combine shipping and we also update the store daily with new items for sale! We appreciate your business! You can follow us on instagram @kevinsclubhouse or on facebook at Kevin’s Clubhouse’ Business Page!